26 October 2013, Filed : Creative Industries, Projects, Regional Arts Fund, UK exchange . Arts OutWest presents The Australian Pavilion Project: Exchanging the art of Central West New South Wales with Derbyshire, UK. The first local part of this project is called ‘Prepare to Exchange‘ – and that’s exactly what it is: Preparing top level local arts practitioners for an international exchange and the kind of work that might entail; especially leading workshops and presenting their work in a new cultural setting. Prepare to Exchange was funded by the Australian Government through the Regional Arts Fund. Preparing to Exchange: 7-8 March 2013 a 2 day residential workshop at The Corridor Project (two fun days in a rustic old woolshed near Cowra) was held for selected practitioners from the NSW Central West region to explore the partnership with Derbyshire. Local practice workshops: The delivery of collaborative workshops at home in Australia (March-May 2013) by the participating creatives, putting into practice approaches developed at the residential workshop. A dozen Australian artists spent September 2013 in the UK. 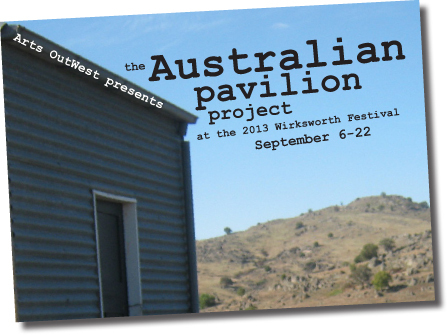 The artists and creatives from Central West NSW Australia set up ‘The Australian Pavilion‘ at the Wirksworth Festival. We took over the Derbyshire Eco Centre, putting artwork on the popular art trail and hosted a theatre double bill in the town. Before and during the festival artists ran workshops, got hands-on and involved themselves in local art projects in Derbyshire. The project, a first big adventure in what will hopefully be an ongoing international partnership, is about providing rural-based Australian artists with international exposure, new artistic challenges and a cohort of fellow artists to collaborate with. It’s about extending both artistic practice and workshop leading skills. it’s about sharing a very Australian selection of art with a UK and international audience. It’s about making connections and learning about your own sense of place by experiencing someone else’s. The Australian Pavilion at the 2013 Wirksworth Festival was supported by Derbyshire County Council and the Derbyshire Eco Centre along with Arts OutWest.